The fourteenth issue, due out March 1, is a must-not-miss collection of astounding stories. Writers include frequent M-Brane contributors Rick Novy and Derek J. Goodman, each with fascinating new offerings. Cat Rambo and Michael Andre-Driussi make spectacular second appearances in these pages, while Ben Phenicie appears with his first published story. 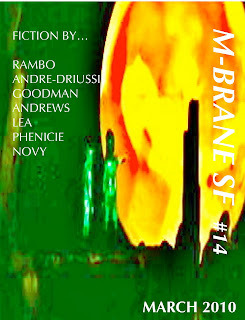 M-Brane first-timers include a couple of my fellow editors: Scott H. Andrews runs the well-regarded fantasy zine Beneath Ceaseless Skies, and Michael C. Lea recently edited the acclaimed superhero fiction anthology POW!erful Tales. Cat Rambo "Fire on the Water's Heart"
Derek J. Goodman "Have You Seen Me?" Scott H. Andrews "Picking up the Spin"
Ben Phenicie "The Estate of Muishi Konimuri"
Rick Novy "Throwing a Haymaker"
OK, more to add to my reading list!